In previous years there have sometimes been complete rail vehicles, but this time there were only some small scale models. Perhaps that was why the exhibition appeared smaller than before. 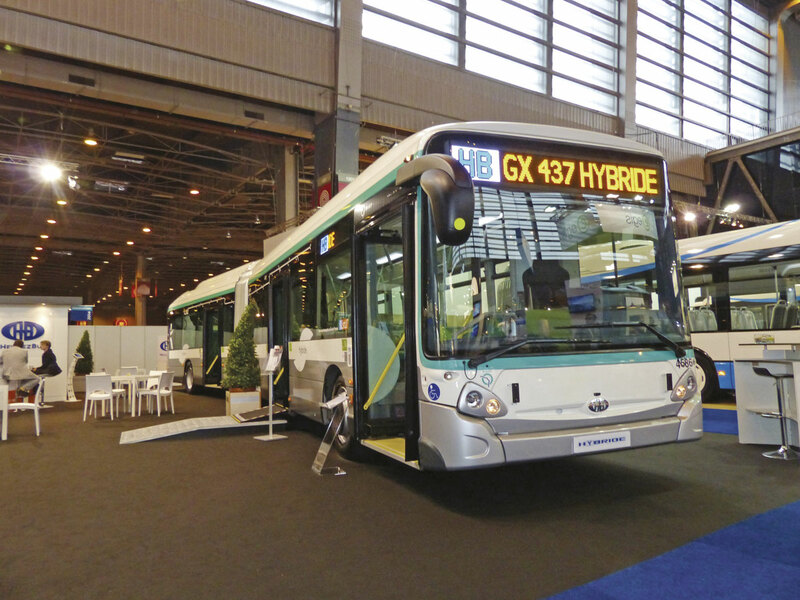 Another factor may have been an exhibition in Bordeaux last November at which a significant number of Euro6 buses were launched. European manufacturers have spent a fortune developing Euro6 models. Now that diesel engines are so clean, they must surely be upset by the decision of Paris and several other French cities that they no longer want to purchase diesel buses, but to specify gas and hybrid vehicles. They consider diesel engines in hybrid buses as range extenders that will be switched off in urban centres. RATP, the major Paris operator, recently announced the award of four contracts for a minimum of 1,000 new buses through to 2017. There might be substantial additional funding from the regional authority, STIF, that could triple that new vehicle intake. It would seem unlikely, because the total RATP fleet strength is just over 4,000 units. 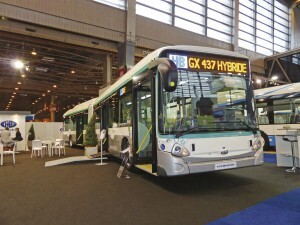 The contracts are for a mixture of hybrid and gas buses. 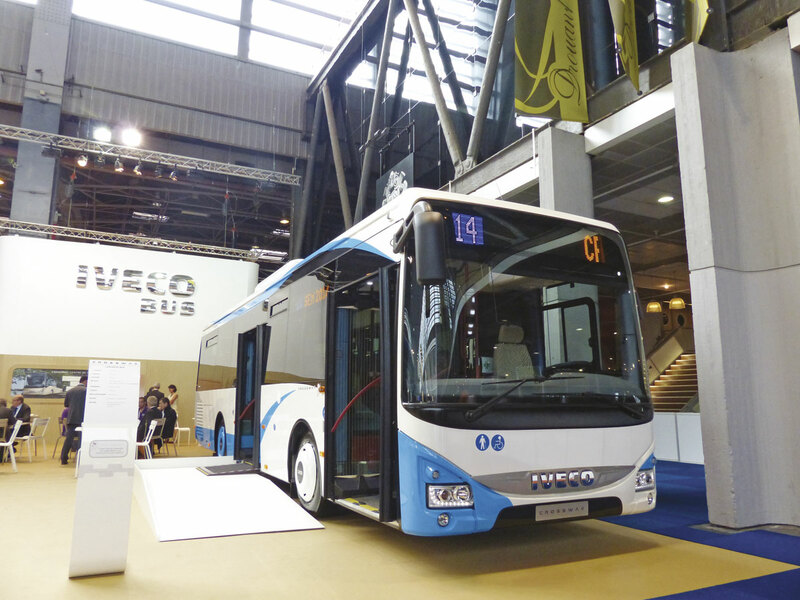 Iveco Bus won two tenders, for up to 600 vehicles of both types. 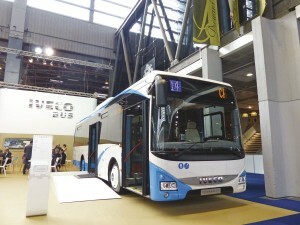 Heuliez Bus will supply 200 hybrid articulated buses, which, like the Iveco models, use the BAE Systems hybrid drive. These feature an ‘Arrive & Go’ facility enabling them to operate with zero emissions at and near bus stops, while also improving the fuel economy. MAN is believed to have won a contract for 200 buses, but there has been no announcement on whether they will be hybrid or gas, or a mix of both. It was said that Mercedes-Benz won a contract to supply diesel Citaro buses, but these were being described as an extension of previous business, so as not to detract from the green image of the other orders! Leading politicians in the French cities want to raise the profile of public transport by investing in trams or very high quality buses. The French equivalent of Bus Rapid Transit is Bus á Haut Niveau de Service (BHNS). Manufacturers have responded with vehicles that look quite different to their more standard products. The most distinctive example in France is the Mettis network in the eastern city of Metz, using Van Hool ExquiCity bi-articulated hybrid vehicles. The city opted for its own unique front and rear end styling, more square than the tapered Van Hool standard on this product. The buses entered service, running largely on their own right-of-way, and have proved very popular with drivers and passengers. 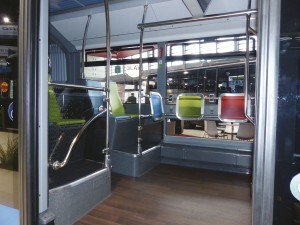 Mercedes-Benz had supplied specially adapted vehicles to the system in Nantes and launched its Citaro G BRT Euro6 with BHNS styling and interior in Paris. The frontal styling was face-lifted with a bright horseshoe-shaped trim beneath the screen, similar to the Wrightbus StreetLite. Externally, a number of windows were inset below the standard waist rail, letting more light into the interior of the vehicle. This can be done without cutting into the corrosion-proofed structure. It also had four double width doors, for faster entry and exit, wood-effect flooring, and recharging points for mobile phones. 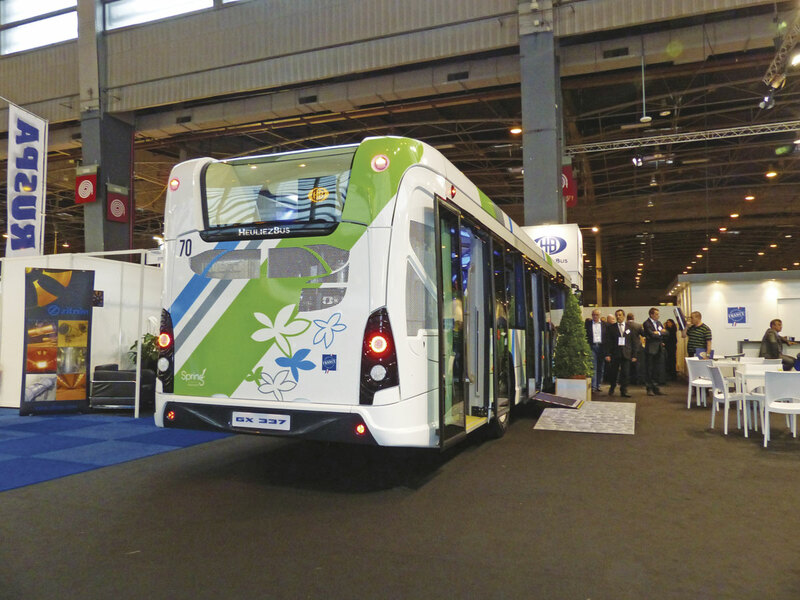 This model will be fitted out for the French market at the factory at Ligny-en-Barrois which built 671 Citaro buses for the French and export markets last year. Structural changes have taken place at the very top of Fiat. When the group split itself into two separate listed companies in January 2011, all the commercial operations, such as Iveco and the Case New Holland agricultural and construction equipment operations, became Fiat Industrial. The latter bought out the remaining shareholders in Case New Holland and the company became CNH Industrial in 2013, trading on the New York stock exchange. This includes the Iveco truck and bus operations. 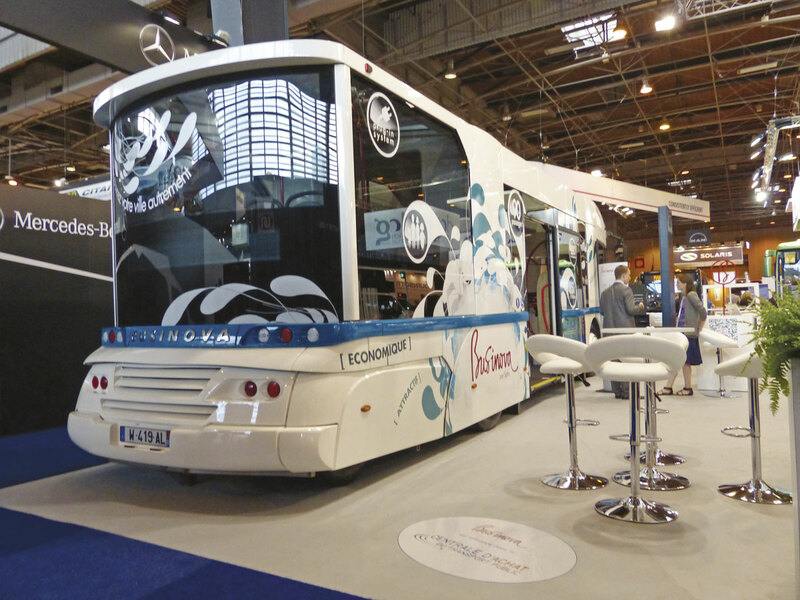 Iveco Bus and Heuliez Bus are making a strong point of the Origine France Garantie label to encourage politicians and others to buy French built buses. Although there is a high degree of commonality between the Iveco and Heuliez models, the two brands are retained, partly because of loyalty to Heuliez. Pierre Lahutte, Head of Iveco Bus, was very visible to customers. 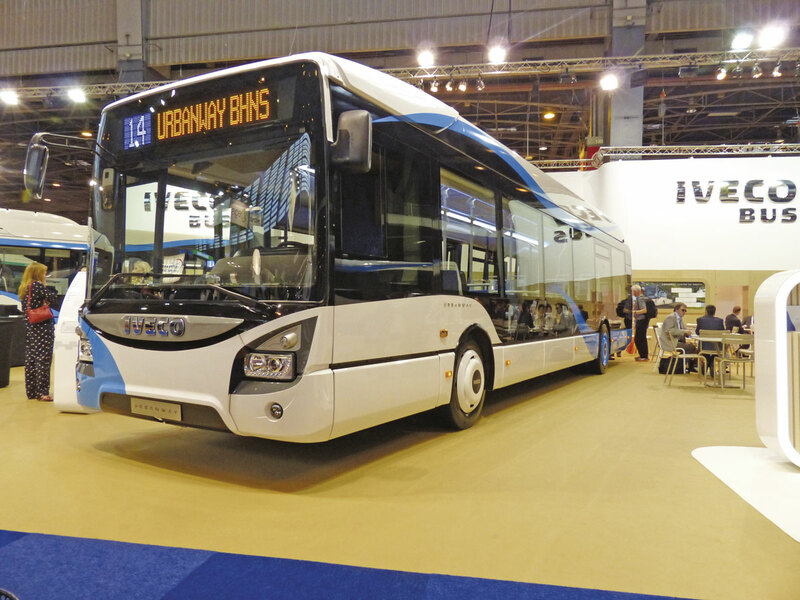 He told me that the Annonay and Heuliez factories reached record production levels last year and that he had been travelling to and from Astana in Kazakhstan to secure an order for 350 Citelis buses, of which 70 will be articulated. He firmly believes that the future for his company lies in supplying complete vehicles, and there are no plans for Euro6 chassis (other than lighter truck-derived). The EuroRider range is still in production with earlier generation engines and recent orders include 300 for Egypt. 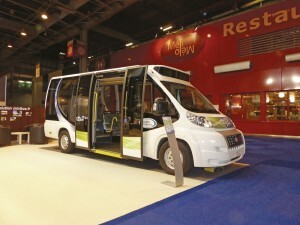 Iveco Bus has had its Crealis BHNS solo and articulated models for a few years. Last month, the company won an order to supply 151 Crealis buses with CNG engines to Baku, the capital of oil-rich Azerbaijan. 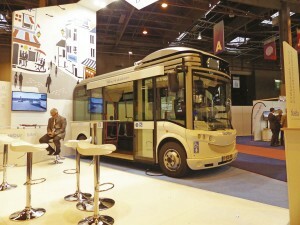 On the stand in Paris, there was a new 12-metre Urbanway Crealis. This used the same structure as the standard Urbanway, but with some customised exterior panels and an enhanced interior layout. The other vehicles on that stand were an Urbanway articulated hybrid bus with a BAE Systems drive and a 6.7-litre Euro 6 Tector engine. I thought the interior was attractive and welcoming. The rear panel of this bus described it as a full hybrid, in English, but it was the same system as here, with the Arrive and Go facility. 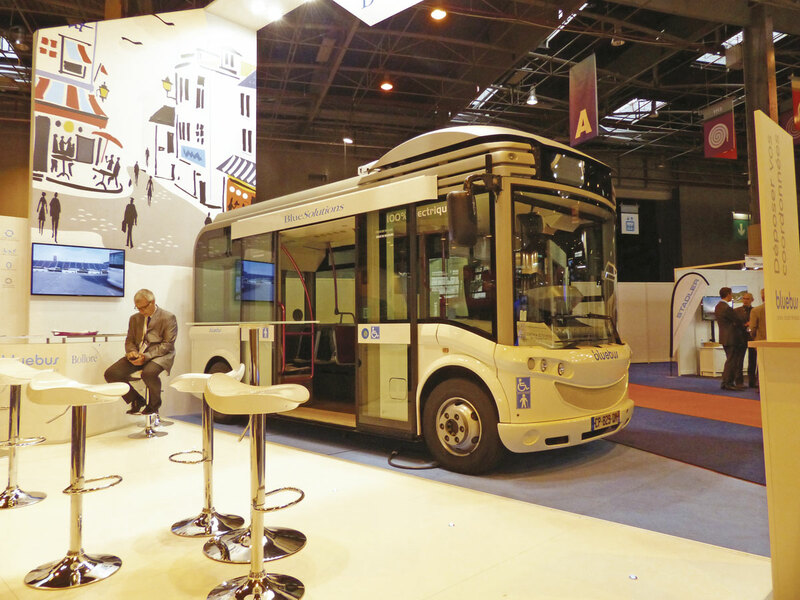 There seems to be a need in France to promote the fact that the bus can run in all-electric mode when arriving and departing from bus stops. The third vehicle was a 10.8m Crossway LE low entry vehicle, homologated as a city bus. The Crossway range has been extensively developed for Euro6 and now covers a number of applications from suburban low entry bus to a multi-purpose coach suitable for day excursions. The new Crossway is available in lengths of 10.6, 12.0 and 13.0 metres, all on two axles. 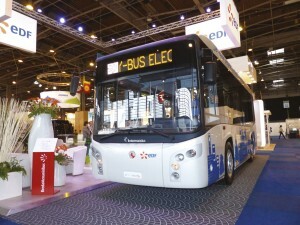 Volvo must feel encouraged by the swing towards hybrid buses in France. They showed a 7900H articulated hybrid model. This one claimed savings in fuel consumption of around 30%. I have seen a number of different savings claimed and achieved by Volvo but this is a figure that they ought to clarify. Scania had a Citywide bus on display. It has a loyal French customer in the city of Angers, which is home to a Scania Truck plant. Solaris was another manufacturer with just one bus on display. It was a standard Urbino 12 for Ruter, one of the operators in Oslo. 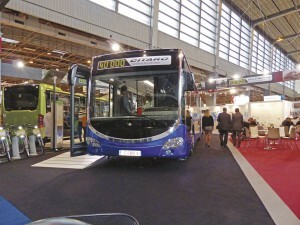 Solaris plans to launch the next generation of Urbino buses at IAA, Hanover, in September. They will still be built in stainless steel, but with savings in weight. Otokar has its European sales and marketing headquarters near Paris Charles de Gaulle airport. 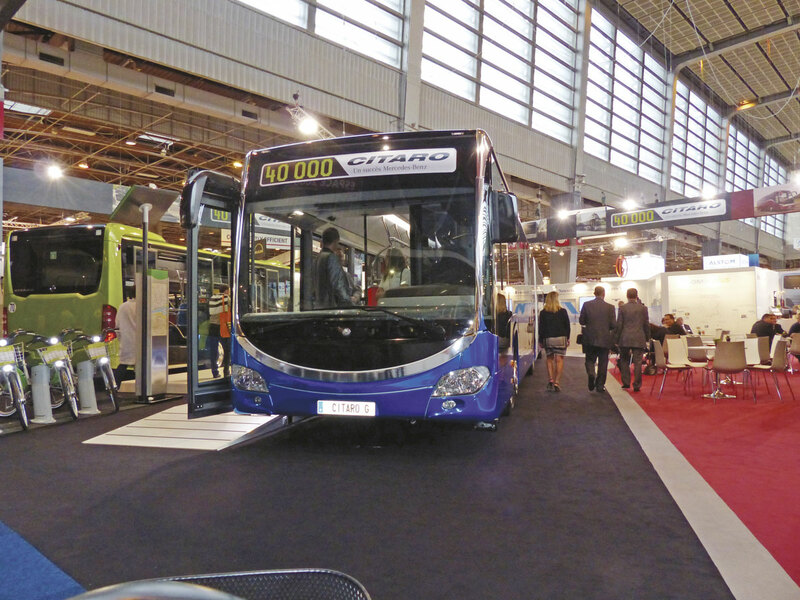 The company showed one of the popular Vectio LE midibuses which are shorter than anything offered by the continental European manufacturers. 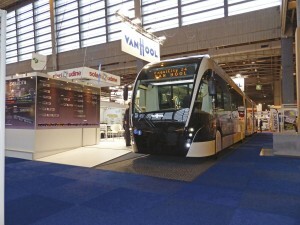 Van Hool showed a bi-articulated ExquiCity vehicle for Luxembourg. The main side panels were covered in a long strip of photographs, depicting Van Hool employees in various tasks in the factory. It was a good talking point, because it showed the various stages of manufacture. Jan Van Hool said that the Belgian factory was busy with specialised vehicles that had high material and labour content, such as the ExquiCity range, double deck coaches and fuel cell buses. With the plant in Macedonia coming on stream for more standard products, the main plant in Belgium is becoming more and more dependent on high value customised vehicles that would not be of interest to its larger competitors. RATP had two stands. One was all about the various forms of public transport in Paris. 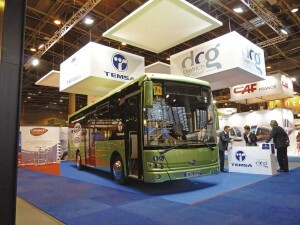 There was a second one for RATP Development which has invested in bus companies in several other parts of the world. It was rather surprising to see a New Routemaster, in the colours of London United. At first, it was locked up, but someone opened the doors and it attracted a steady flow of visitors. Several commented on the high quality of the interior trim and the novelty of the upper deck. 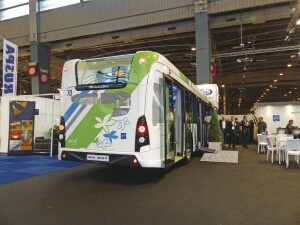 One of the main themes of the exhibition was electric vehicles. These were all less than full size, mainly designed for inner-city precinct operation, with easily accessible entrances. PVI, the former Ponticelli, is probably the leader in France in this field. The largest model is built with an Otokar low entry midibus structure, but there are also smaller models based on van conversions. Safra again displayed its novel Businova. This had a low entry layout at the front, with a high rear saloon above a complete hybrid drivetrain consisting of a thermal engine, hydraulics, batteries and a portal rear axle. The styling is unusual, but not unattractive. It will be interesting to see whether it can secure some reasonable orders and go into volume production, or whether it is still ahead of its time. The Dietrich Group had a stand with prominent Temsa and Yutong banners, but the only product was a low entry Temsa midibus with a Euro6 engine. The company has worked very hard with Yutong to develop specifications that meet the requirements of European customers in terms of style, comfort and durability, but they are more for the multi-purpose and coach sectors. There was an article in last week’s issue about BredaMenarinibus and King Long. The Italian company had a small stand and signed a contract to supply six of its little Zeus all-electric minibuses to a French customer. A spokesman said that discussions were being held between King Long Italia, a major haulage company in the south of Italy, and the regional government with a view to acquiring the former Iveco factory at Valle Ufita, inland from Naples. King Long in China does not appear to be involved in the project! It would be very surprising if this plan was able to make progress, because it is hard to see any economic sense, given the enormous size of the factory and high Italian labour rates. The exhibition was well attended, despite taxi and rail strikes that caused massive traffic congestion. If ever there was a World Cup for industrial action, France would be the winners!